Partially recycled rubber All-Terra outsole. New without box. Platform wedge sneakers. 2" heel height. They are used, but look very cool. Although they are used, you will get a lot of good wear out of them. They are very solid and nice. I have taken a lot of good ones. Close inspection will illustrate the use/wear. Style/model: S421929. Model: Sport Walker. Shade: White. Heel Height: Low (3/4 in. to 1 1/2 in.). The original box may not be included. The upper is in perfect condition, and minimal signs of wear on insole and outsole. Textile / vegan upper. You'll love the reflective accents along the trim that only adds to your look. A simple tug here and a little loosening there and you have a fit that works for you. Drainage ports are incorporated into the antibacterial footbed, allowing water to easily escape. Hook-and-loop strap at instep for easy adjustability. Color: Grey / Teal. Vegan-friendly construction. These shoes are in excellent pre-owned with no known defects to report. 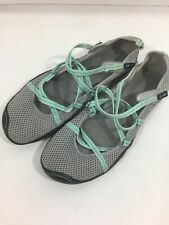 Grey Vegan Nubuck Leather Green Trim H&L Straps Sneakers Womens Size 9.5 M. Condition is Pre-owned. Shipped with USPS Priority Mail.